How will architects, engineers, craftworkers, and contractors design and build masonry structures that are sustainable, energy effiicient, and resilient now and into the future? With innovative thinking and solutions -- ones that reimagine the potential of masonry materials and applications. That's where the inaugural Joan B. Calambokidis Innovation in Masonry Competition comes into play. 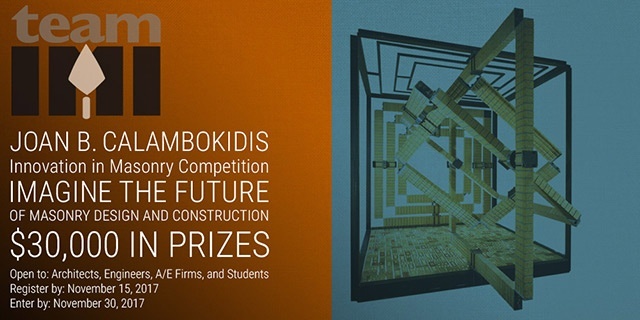 Named for former IMI President Joan B. Calambokidis -- who retired in April 2017 after more than 20 years leading the organization -- the competition challenges architects, engineers, students, and firms to imagine the future of masonry design and construction. During her tenure as president, Calambokidis strived to foster collaboration between craftworkers, contractors, and designers to improve building design and construction. The competition honors her legacy and spirit of innovation. Three grand prizes will be awarded across 3 categories, totaling $30,000 in award money. Participants are encouraged to use their creativiity to determine the scale, size, program, and location of their project. Approaches that explore energy efficiency, resiliency, sustainability, mass customization, use of BIM, computational design, and emerging construction and manufacturing techniques are encouraged. Visit the competition website and read the competition brief for more details, including submission requirements and how to enter. To participate, entrants must register online by November 15, and submit their projects between November 15-November 30, 2017. If you have an innovative idea for the future of masonry design and construction, enter the competition!